Home never felt so good for the Canucks. Mikael Samuelsson scored twice and added an assist, and the Vancouver Canucks returned home to GM Place after playing an NHL-record 14 straight on the road to beat the Ottawa Senators 5-1 on Saturday night. Living out of a suitcase grows weary after a while but Vancouver survived it. They are 3rd in the Western Conference points stands and more importantly five points ahead of the next best team in the NHL’s Northwest Division. I don’t see the Canucks missing the playoffs but don’t think they’re good enough to advance to the Stanley Cup finals. The Dallas Stars placed Alex Auld on waivers Wednesday and are content to go with Marty Turco and Kari Lehtonen in goal the rest of the season. Stars general manager Joe Nieuwendyk acknowledged there’s little chance of trading Turco, who played well the last six games leading into the Olympic break. Turco is 4-1-1 with a 1.15 goals-against average and a .967 save percentage in that stretch. Lehtonen, 26, has not played an NHL game since last April. 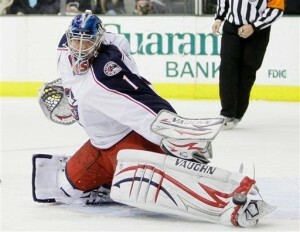 The Stars traded for him earlier this month in an effort to fortify their goalie position going into next season. Lehtonen is a restricted free agent next season, while Turco and Auld are unrestricted free agents. The Stars are one point out of the eighth and final playoff spot and have games every other day in March. “We’ll work Kari in there because we have so many games,” Nieuwendyk said. 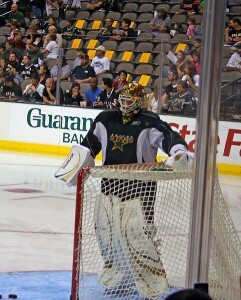 Auld is a journeyman Goalie who has played for six teams since 2006. That says enough about how good he is. Could a 7th team on the horizon? I’d say the chances are about 50-50. If Auld can’t find work in North America, he can always go to play in Europe. 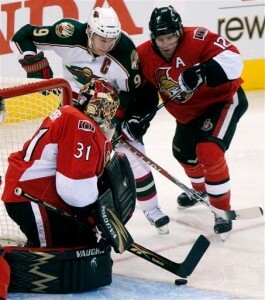 Mike Brodeur made a name for himself Saturday night in his NHL debut for the Ottawa Senators. No relation to New Jersey goalie Martin Brodeur, the rookie goalie carried a shutout into the third period, and Erik Karlsson scored his first career goal, leading Ottawa to a 4-1 win over the Minnesota Wild. Brodeur stopped 22 shots in his first career start after backing up Brian Elliott for 13 straight games. Actually this article states Mike and Marty Brodeur are distant relatives. Just last season Mike Brodeur was toiling for the Rochester Americans, the AHL affiliate of the Florida Panthers. 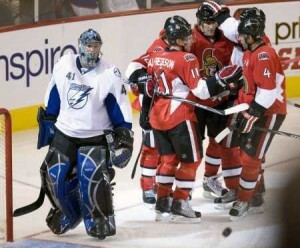 In spite of having a very good season, Ottawa some how came into possession of the Goalie. The Panthers are so cost conscious, I’m at least partially surprised they didn’t bring Brodeur to the NHL this year rather than sign free agent Scott Clemmensen. Brodeur would have been cheaper, and die hard South Florida hockey fans all know how much the Panthers watch their bottom line usually to the detriment of the team’s chances to compete. Just look at how the exchange of Clemmensen for the slightly higher priced Craig Anderson has been working out for Florida this year. BTW Clemmensen had one of his better games as a Florida Goalie last night. Still the Panthers ended up losing to the Carolina Hurricanes 3-2. Milan Michalek made Ottawa Senators fans forget about high-scoring Dany Heatley — at least for one night. Acquired at the start of training camp in the deal that sent Heatley to San Jose, Michalek had his first three-goal game in the NHL, scoring twice short-handed and once on a power play in Ottawa’s 7-1 victory over Tampa Bay on Thursday night. Michalek shoveled a rebound past goalie Mike Smith with Tampa Bay on the power play in the first period. The big Czech winger then beat Smith again on a short-handed breakaway early in the second, helping the Senators to their fourth win in five games. Tampa was outshot 35-17, making it appear they are still inadequate at the position of defenseman. That was the team’s biggest weakness during the 2008-09 NHL season. Tampa is 2-2-2 so far this year. The Florida Panthers are 1-4. Most hockey prognosticators, plus myself, would have had these teams reversed in their predictions for this far into the season. I’m not giving up on the Panthers yet. After a 4-3 start last year they went through a dozen game stretch where little went right. The Panthers then rallied to almost make the playoffs. Hopefully tonight’s game against the Philadelphia Flyers will spark a turnaround for my favorite NHL team. The Ottawa Senators traded disgruntled winger Dany Heatley to the San Jose Sharks on Saturday, ending a lingering dispute with a player who felt he was not being used properly by the team. The Sharks gave up Milan Michalek, Jonathan Cheechoo and a second-round pick. Ottawa also sent a fifth-round pick to San Jose. The trade on the opening day of training camp ends a clash that has overshadowed the Senators in recent months. The 28-year-old Heatley said he wanted out of Ottawa because he wasn’t being used properly. But he angered fans when he refused to waive a no-trade clause to move to Edmonton. “When I signed in Ottawa two years ago, I felt it was to be an integral part of the team,” Heatley said in August. “Over the last two years and more recently over the past year, I feel my role was diminished. This past season, it diminished a lot more. The Sharks beef up their offense by acquiring a former 50-goal scorer. Heatley had 39 goals and 33 assists last season. Heatley has 260 goals and 283 assists in 507 regular games, split between Atlanta and Ottawa. He is due to make $8 million this year. Michalek, a 24-year-old winger from the Czech Republic, had 23 goals and 24 assists in 77 games last season. His salary is $3.5 million this year. The 29-year-old Cheechoo, a hard-nosed winger, had 12 goals and 17 assists last season. He’s due to make $3.5 million this season. From the point of view of what talent was exchanged, San Jose came out on top. When everything else is considered, I think Ottawa was a winner. Heatley is a very unhappy person in Ottaw, even though he was the Senators leading scorer and the team’s first or second most valuable player on ice. (A strong argument can be made that Forward Daniel Alfredsson is better than Heatley.) Heatley wanted out of Ottawa, claiming his role was diminished there but how so was it diminished. What’s really at play here is that Heatley is a troubled young man. His reckless driving killed his best friend and teammate Dan Snyder in 2003. NHL fans and Snyder’s family forgave Heatley but I’m pretty certain Heatley hasn’t been able to forgive himself and that’s why he asked for a trade from Atlanta in 2005 and his most recent trade out of 2009. He’s looking for a place to be comfortable. Heatley will never be comfortable anywhere he lives till he forgives himself. I don’t think that will happen before his hockey days are over. Playing the sport is a constant reminder of his friend who unlike him can’t play the sport they both loved so much. He played for 12 different teams in his career but he scored the most points for his final team, the New York Islanders. Enjoy your retirement Mike. New York Islanders center Mike Sillinger decided two hip operations were enough. The center who played for a record 12 teams during 17 seasons in the NHL is retiring because of an injured left hip. The 38-year-old forward played in only seven games last season and had season-ending hip resurfacing surgery in January. In February 2008, he had a microfracture procedure on the hip that forced him to sit out the final 29 games of that season. Sillinger spent three years with the Islanders and his 42 goals and 87 points were his most with any NHL team. Sillinger was chosen No. 11 in the 1989 draft by Detroit. For his career, he had 240 goals and 308 assists in 1,049 games. Sillinger said he’d like to stay in hockey but downplayed the notion that he might go into coaching right away. “I’m just going to enjoy the kids for now and see what the future brings,” he said. Besides the Islanders and Red Wings, Sillinger also suited up for Anaheim, Vancouver, Philadelphia, Tampa Bay, Florida, Ottawa, Columbus, Phoenix, St. Louis and Nashville. A year after Ottawa released the petulant goaltender, forcing him to turn to a Russian league when no other NHL team would take him, Emery agreed to a one-year contract with the Philadelphia Flyers worth about $1.5 million. General manager Paul Holmgren believes Emery, 26, has mended his mercurial ways and again can be the player he was when he helped the Senators to the Stanley Cup finals in 2007. Emery missed practices and clashed with teammates in Ottawa and was charged with multiple speeding violations and a road rage incident. Emery insists he’s learned from the past. Ottawa was a very good goalie up through the 2006-07 NHL season when he helped Ottawa reach the Stanley Cup finals. Then he entered hurt, didn’t play very well, and had the problems listed above. The Senators tired of Emery’s antics, gave his release. That the team then tried to play winning hockey with a couple of schlock career backup goalies(Alex Auld and Martin Gerber) is a whole other story. Philadelphia had a good Goalie in Martin Biron, but he along with the Flyer’s backup Goaltender are unrestricted free agents this off season. The team didn’t want to pay Biron what he was asking for salary wise, so Philly went with the cheaper option of Emery. Emery for Biron is at best a lateral move for the Flyers. It can backfire, if Emery begins misbehaving again.